A minimum is observed at midnight in the time variation of averaged zonal winds measured in-situ near the equator at an average altitude of about 350 km, and we inquire whether observations of the equatorial midnight pressure bulge are consistent with this feature. The observed zonal wind maintains an eastward direction all night. It increases steadily in the early evening reaching a maximum of about 160 m/s at 2100 hrs local time (LT), dropping to a minimum of about 70 m/s around 2400 LT, then up to about 120 m/s around 0300 LT, decreasing thereafter and turning westward in the morning around 0500 LT. The nighttime eastward ion drift at Jicamarca, averaged over periods of similar solar activity (1970-71), shows the same signature, but generally with amplitude between 70 and 90% of the zonal wind amplitude. The 1978-81 Jicamarca ion drifts are similar except from 2400 to 0300 LT when they are about 30% larger than the in-situ zonal wind averages. The ion-drift is used together with the measured zonal winds to estimate the ion-drag effect in the momentum equation. The pressure term of this equation is estimated using in-situ measurements of the neutral temperature and density. The pressure term is found to be large before 2100 LT (∼0.05 m/s²), consistent with the steady increase in zonal wind before 2100LT, drops rapidly to near zero (roughly 0.005 m/s) before 2200 LT, and then increases slowly beginning at 2300 to about 0.015 m/s² just before 0300 LT when it is observed to reverse. The small pressure term observed from 2100 to 2400 LT is associated with the midnight pressure bulge and accounts for the decay of the wind from 160 m/s at 2100LT to 70 m/s at midnight. The larger value at 0300LT is consistent with the second maximum in the wind. It is found that the existing data sets are consistent in terms of zonal momentum balance. The striking similarity between the zonal wind and the eastward ion-drift is responsible for the small ion-drag term before midnight which is required to maintain the large zonal winds observed. 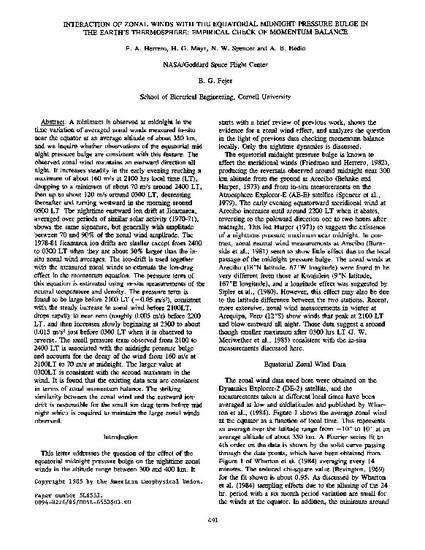 Herrero, F. A., H. G. Mayr, N. W. Spencer, A. E. Hedin and B. G. Fejer, Interaction of the zonal winds with the equatorial midnight pressure bulge in the Earth's thermosphere: Empirical evidence of momentum balance, Geophys. Res. Letts., 12, 491, 1985.